Eriksberg on the northern bank of the Göta River where housing areas have replaced the shipyards. Hisingen is an island on the west coast of Sweden. It has an area of 199 square kilometres (77 sq mi). 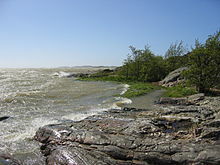 It is Sweden's fourth biggest island, but its most populated island. It is north of Gothenburg. Göteborg City Airport is there. ↑ "Statistisk årsbok 2011" (in Swedish). Statistics Sweden. p. 12. Archived from the original (PDF) on 5 July 2011. Retrieved 5 July 2011. This page was last changed on 31 August 2017, at 03:21.